Top Three Batsh*t Crazy Science Stories Of The Month! First, European physicists were all, yah, the Large Hadron Collider (LHC) is big and all, but we want to build a particle collider longer than the Panama Canal! THEN scientists said that the Earth's magnetic pole is acting out of sorts and that the model they made that was supposed to be good until 2020, needs updating. 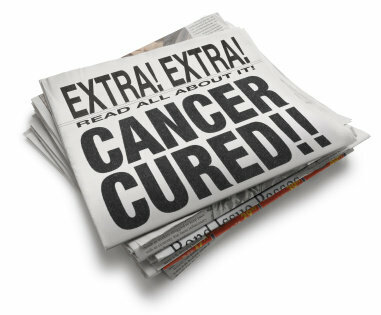 As if THAT wasn't enough, some Israeli cancer researchers said they would have the cure for cancer ready in a year! So, yeah, all three of those stories happened last month. Let's cover each in a science lightning round! First of all, why do have these damn things? Well, to learn about the universe, buey! The big daddy colliders, like CERN's Large Hadron Collider, shoot beams of energy at other beams of energy causing collisions (hence why they're called "colliders" duh) resulting in small particles breaking up into smaller ones. Scientists can then study how the smallest bits of matter behave and discover ever smaller ones that have been predicted but never before seen. Remember the Higgs Boson, aka "the God particle"? Yep, the LHC found it first. So, those crazy Europeans want to biggify and biggify, big time. The LHC is 27 kilometers long (or almost three 10-k's for the runners with poor math skills reading this) and is in both France and Switzerland. 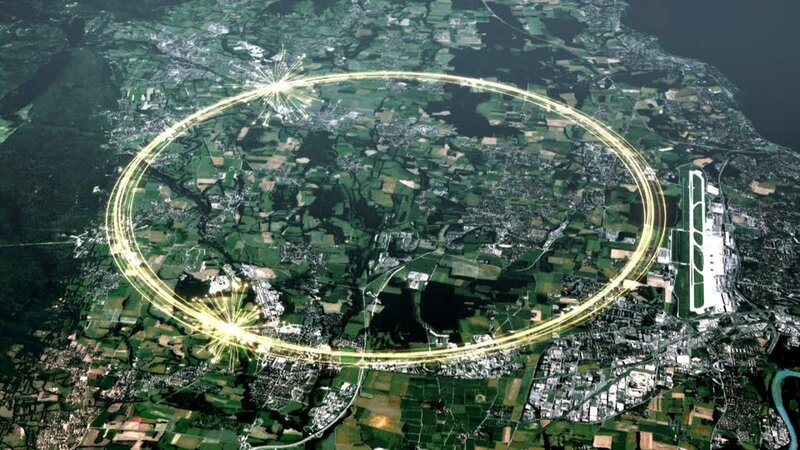 The cleverly named "Future Circular Collider" design would be 100 kilometers long! This upgraded collider would search for particles that aren't even yet predicted to exist and open the path to an even more powerful one to follow. If they really go for it, it wouldn't be operational until around 2040, which is when the LHC is scheduled to shut down. If only my iPhone would last that long between models. However, the Chinese also have plans to build a big boy collider by 2030, so in addition to the space race to Mars with them, it looks like there will be a collider race as well! photo credit in actual photo! Earth's magnetic field helps protect us from pendejo solar winds that would love to strip the ozone layer and let us cook. It's also why your compass app on your smart phone points to north. 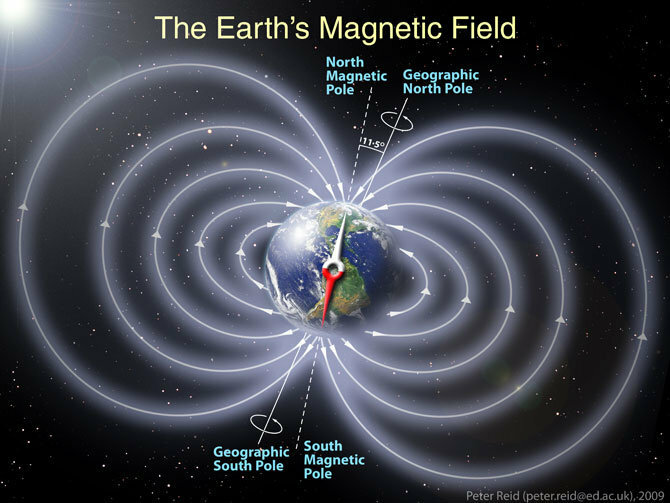 As you may know, the magnetic field shifts over time and sometimes the magnetic poles flip. Last time that happened was almost 800,000 years ago. We know it happened because of analyses of magnetic minerals in sediments. The reversal isn't quick, at least in human terms, happening in a hundred to several thousand years. We don't actually know how long they take. Well, although the 2015 US/UK World Magnetic Model was supposed to be solid until 2020, it's looking a bit wonky now. The magnetic pole is moving out of the Canadian Arctic and toward Siberia in a manner not predicted. What if this is a sign of the flip? Don't stress! It would be a gradual process and it would likely, yes, make some ozone holes for a while as the magnetic field weakens during the midpoint of the reversal, but they would heal. Scientists have been working on an update that was supposed to come out end of January to address this weirdness and let us know if the flip is coming. However, government shutdown fun caused a hiccup and we still don't have the update. Stay tuned! This story making the rounds REALLY irritates me. Let me summarize what is being reported, hopefully without my head exploding. "We believe we will offer in a year's time a complete cure for cancer," said Dan Aridor. "Our cancer cure will be effective from day one, will last a duration of a few weeks and will have no or minimal side-effects at a much lower cost than most other treatments on the market. Our solution will be both generic and personal." So, what is this amazing discovery/approach? In a nutshell, it's a multi-pronged attack on cancer cells, hitting several targets before the cell can mutate and adapt to a single attack. It's a good idea, but not a new one. We've been doing this with combination therapy already, and it HAS shown some advantage over using one targeted agent at a time. However, others are also trying if not the EXACT approach as AEB, the same idea. You know what? It hasn't cured cancer yet and if you are a constant reader of mine, you'll recall why a single cure for all cancer ain't gonna happen. So, these snake oil … I mean scientists have an interesting spin on a good idea that many of us have already been trying out. Why WON'T they cure cancer in a year? Because the most advanced data they have is in a single mouse experiment where they killed cancer cells. Well, congratulations, fellas! Literally, EVERY cancer drug I've worked on cured cancer in xenograft mice and then most failed in actual, you know, CLINICAL STUDIES REQUIRED TO GET APPROVAL! Even if this WAS some magic bullet to cure all types of cancer (it's not), they are years away from getting the preclinical work done and manufacturing scale-up, quality work before this is put into humans. And THEN it's another four to ten years in the clinic, assuming the damn thing works. Crap! My head just exploded. Sorry for the mess. Wonkette is ad-free and funded ENTIRELY by YOU! Please go get your wallet if you like what you read! I am a biochemist MexiCAN. I also write screenplays, ever hoping to get one made.